League of Women Voters of West Virginia’s website provides the resources you need for Election Day 2014, Tuesday, November 4! On the right hand side of our website under the “Election Info” links, click on Find Your Polling Place and enter you name and birth date to find your County/Precinct and Polling Location. Next visit 2014 General Ballot, click on your respective County, and then download the sample ballot for your Precinct. This ballot looks exactly the same as the one you will be using at your Polling Place. If the voter’s registration record is not available at the time of the election. If the signature written by the person in the poll book does not correspond with the signature on the registration record. you are permitted to vote using a Provisional Ballot, and you have the legal right under WV Code §3-1-41 to check the status of your Provisional Ballot at the Provisional Ballot Tracking page. Finally, you will want to watch Election Result Center late into the night! 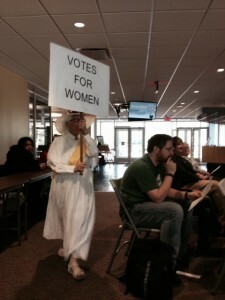 Picture of a LWV Huntington woman, re-enacting the Suffragist movement. The League provides a readers theater on the progress and regress of voting rights in the U.S.